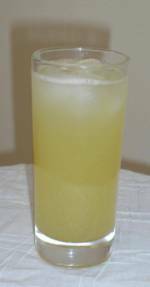 This is a very refreshing drink made especially during the summer time in India when mangoes are in season. It is served when anyone comes in from the hot sun. The touch of black salt and cumin powder gives a unique taste to this appetizer. Don't be surprised if you are hungry after having this drink. 2. Pressure cook mangoes with the 1 1/2 cups water for four whistles. Take a deep saucepan, add mangoes and water. Cover and cook until mangoes are tender. When the skin becomes pale green the mangoes are ready. Cool. 3. When cool, peel the skin, remove seeds and squeeze out all the pulp. 4. Put the pulp in a blender along with water. Add sugar, cumin powder and black salt. Blend mixture until everything is pureed well. 5. Store panna in an airtight bottle. Can be stored in the refrigerator for up to 15 days. Add 1/3 panna to 1/2 glass of chilled water. Add crushed ice and serve. Love it!!! My mum makes it often!!! Thanks for sharing it!